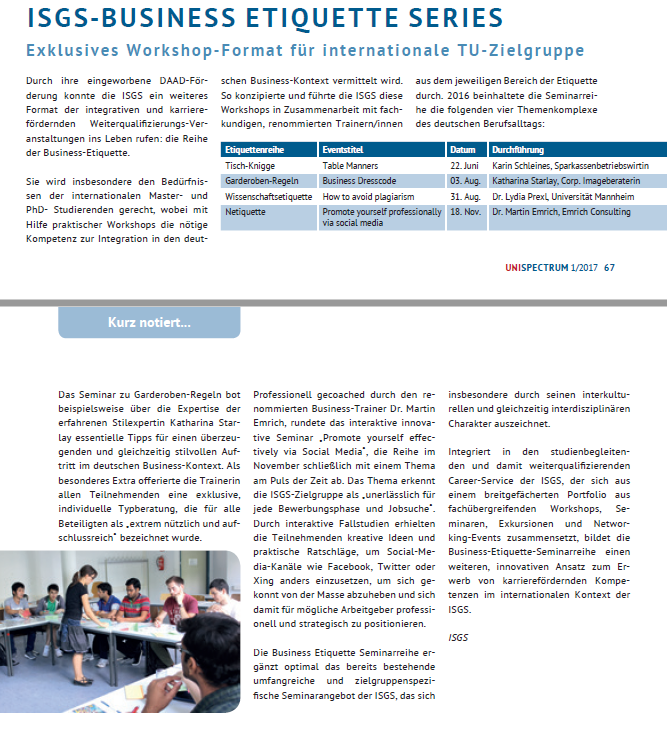 The Department of International Affairs: ISGS offers so-called "Intercultural weekends" to international and German postgraduates. These weekends enable German & international doctoral students and young researchers to experience life & work in an international and interdisciplinary context. By dealing with an intercultural or Soft-Skills topic, participants can reflect their attitude towards and train their behaviour in a multicultural and globalized society. Impressions of the last intercultural weekend: can be found here. The ISGS offers various workshops aimed at acquiring skills and qualifications in the areas of human resources development and management, communication, conflict, presentation, etc. You have the possibility to enhance your qualifications in various interdisciplinary areas. The offers of the Doktoandenforum are intended mainly for post-doctoral or PhD students and scientific staff of the TU Kaiserslautern. However, many offers are also open for Master students. Find out more about the Doktorandenforum!